After a few spring-like days, the snow is back. Does this sound familiar? You’re standing in the SmarkPak clearance loft chortling over the deal you just got on an 84″ Rhino blanket. Just $97? You run to the checkout before someone else can grab that last, heavyweight blanket out of your hands. I decided that I deserved to be as warm as Zelda. And she was warm, even on the coldest mornings when I reached under her blanket she was toasty. My warm weather strategy starts with a hat, scarf and a good smattering of hay. Plus a heavy duty down jacket. it has no rips or tears and it has lots of fluffy down. You start to put it back. $119 is too much you say. Your child stares at you in disbelief and suddenly you realize that with arctic temperatures descending on New England, you deserve to be warm, too. 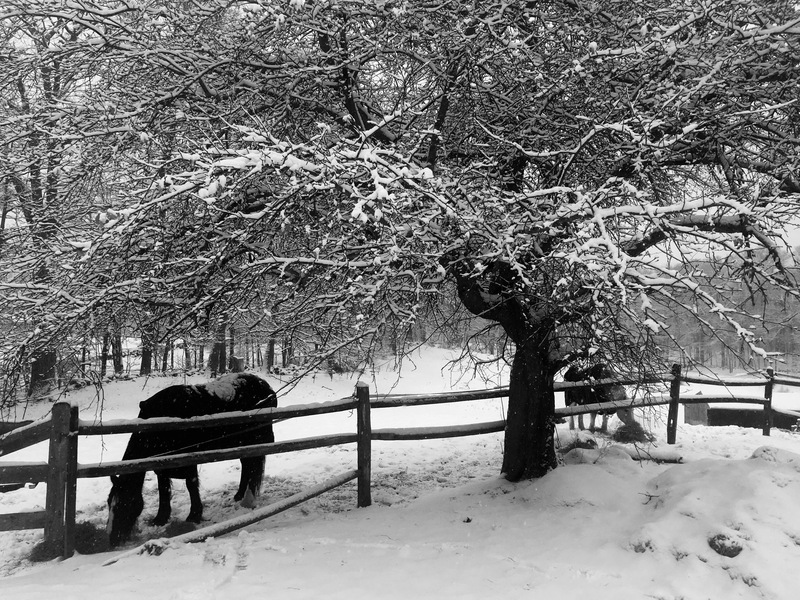 This winter has been tough on horses and humans alike. We’ve ping-ponged from sub-zero temperatures and biting winds to spring like days in the 50s. Now we’re back to “seasonal” temps and snow. The bitter cold really affected me. It didn’t help that I was ill during the worst of it. 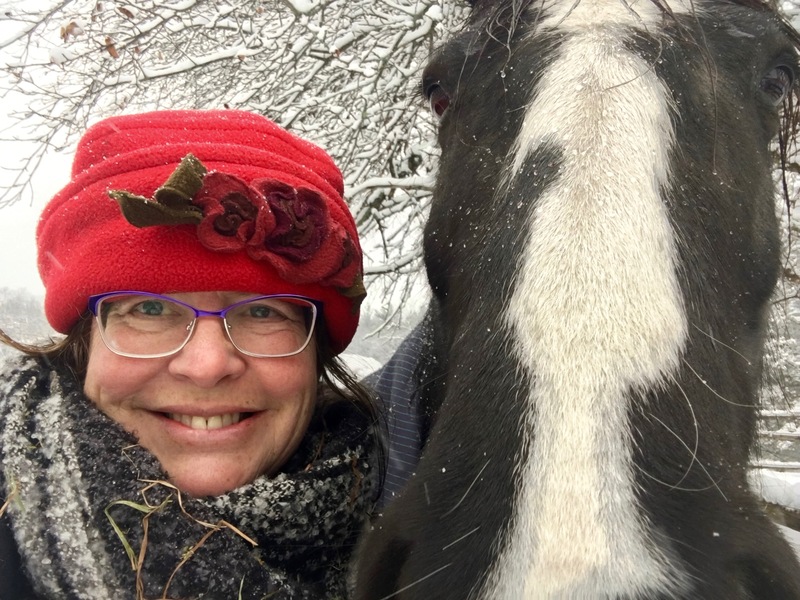 I was so tired and sick that I often got only half way through feeding the horse when I had to go warm up in my car and rest. My fingers didn’t actually get frost bitten, but they sure got cold. I mentioned this to my doctor at my annual check up this week, that the tips were getting frighteningly cold. She looked at me with that “duh” expression, the one that says so eloquently, “what do you expect when you’re feeding horses and it’s -8 degrees out?” Her advice? Warm up in the car half way through. 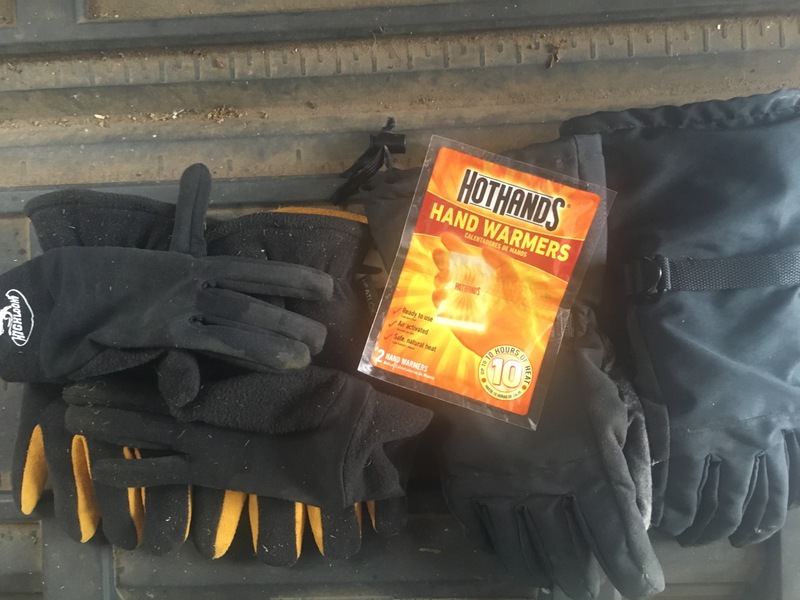 My assortment of hand protection — glove liners, hand warmers and two kinds of outer glove! Start with glove liners. They may not be that warm but when you need fine motor skills to mix grain, they are life savers. Use hand warmers. These air activated packets are worth their weight in gold. I put them in my pockets on the drive over so that when I get there, my pockets are toasty. Then I slip them in between the outer glove and the liner. Here’s a tip: you can keep them going for multiple days if you seal them in a zip lock back and squeeze the air out. Outer gloves: I have two kinds. The deerskin gloves are supposed to be rated to -20. That’s not true but add the liners and the hand warmers and they’re pretty good. They also allow for a reasonable amount of dexterity. Unfortunately, they are not water proof so I also have ski gloves that provide less range of motion but keep moisture out. They also have zipped pouches for the hand warmers, but those pouches are on the back. I still haven’t figured out why. It’s my fingers that get cold not the backs of my hands. For some reason my toes haven’t had the same reaction to the cold. I have Bogs cold weather boots and wear wool socks. My feet, than God, are fine. FAB products absorb quickly, aren’t greasy, aren’t tested on animals, and are made in the USA. To avoid the chapping that seems inevitable on my hands and face, I’ve started keeping a tub of moisturizer in the car. 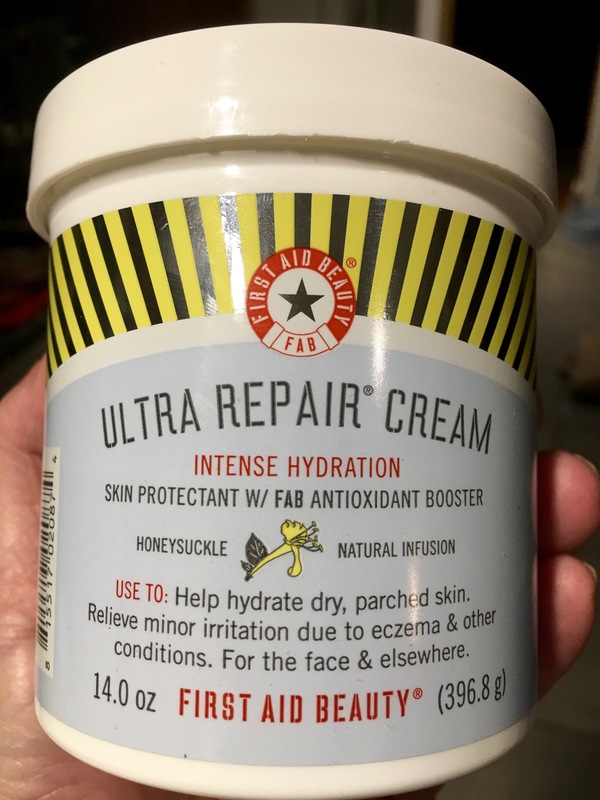 This is my current favorite — First Aid Beauty Ultra Repair Cream. The cream absorbs quickly, isn’t greasy, is cruelty free and made in the US. I have the honeysuckle version now but the regular scent is very unobtrusive. I slather this on my hands and face before getting out of the car. What are you tips for surviving the cold weather? Other than moving south? Believe me, the thought of packing up and leaving until Spring has been a recurring theme in our house! Great post! I recognized myself (cheap on me, extravagant on horses). I bought SSG minus 10 gloves and although the ends of my fingers get cold after an hour of stall cleaning, they are pretty good and are made of a grippy material on the outside so the pitchfork doesn’t spin in my hands. I hate that. It’s been crazy cold down here in Maryland, but as a former Massachusetts gal, I feel your pain. I’ve been watching the temperatures south of here and you’ve been hit with cold weather too. No escape! I’m just glad the horses have been doing okay.